Selling for $209.99 0 1 Like this product? This handy 7” tablet with brilliant IPS screen produces excellent screen color, 178 degree visibility and a stutter-free experience. This tab is ideal for everyday travel companion and its lightweight design makes it easy to carry everywhere. Tired of tablets that perform sluggishly and are slow to download data? Meet the Lenovo Idea Tab A3000, a high-performance tablet that's portable enough to slip in your jacket pocket. The A3000's quad-core CPU means it's ultra-responsive, its bright IPS screen ensures better viewing angles and brighter images and its lightweight design makes it easy to carry everywhere. Introducing the IdeaTab A3000, the ideal everyday travel companion. At less than one pound and powered by a Quad-Core processor, this handy 7” tablet with brilliant IPS screen produces excellent screen color, 178 degree visibility and a stutter-free experience. Plus, the integrated front and rear cameras ensure there’s never a dull moment. Take it anywhere. Tired of tablets that perform sluggishly and are slow to download data? 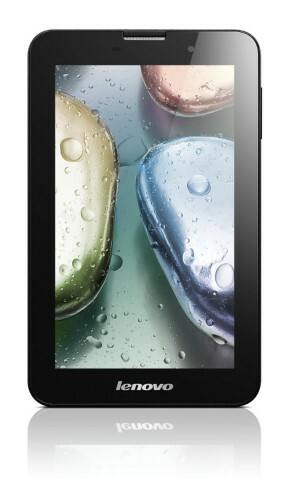 Meet the IdeaTab A3000, a high-performance tablet that’s portable enough to slip in your jacket pocket. The A3000’s quad-core CPU means it’s ultra-responsive, its bright IPS screen ensures better viewing angles and brighter images and its lightweight design makes it easy to carry everywhere. The IdeaTab A3000's quad-core CPU accelerates performance and makes it perfect for virtually all forms of tablet gaming. The IdeaTab A3000's HD display offers a clear and colorful viewing experience whether indoors or outside. The in-plane switching (IPS) screen delivers a wide viewing angle, perfect for sharing content with friends in groups. At 11mm (0.43") thick and weighing in at a mere 345g (0.76 lbs), the IdeaTab A3000 is a perfect size for reading, listening to music, and web-surfing – and it can easily slide into a pocket when not in use. Lenovo Group Ltd. is a Chinese multinational technology company with headquarters in Beijing, China, and Morrisville, North Carolina, United States.It designs, develops, manufactures and sells personal computers, tablet computers, smartphones, workstations, servers, electronic storage devices, IT management software and smart televisions. In the second quarter of 2013 Lenovo was the world's largest personal computer vendor by unit sales.It markets the ThinkPad line of notebook computers and the ThinkCentre line of desktops.